Using a flat stiff brush and patting motions, apply the lighter silver shadow all over your lid, staying under the crease. 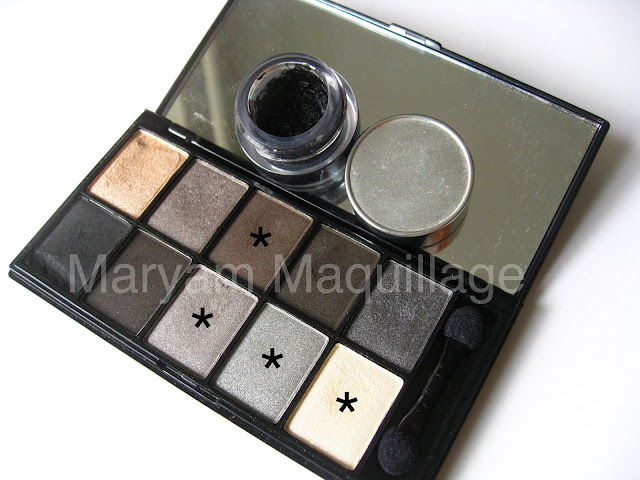 Next, apply a darker silver to the outer corner using the same brush and technique. This step gives the eye more dimension and smokiness. Take a warm matte brown shadow on a fluffy dome shaped brush and blend out the edges of the silver using windshield wiper motions. The shadow should be applied on the crease or slightly above the crease. Clean the fluffy dome brush and "erase" or blend out the edges of the brown using the same windshield wiper technique. Add a highlight to the inner corner and at the high point of your brow arch. GOD I MISS THAT CITY!!! did you read my mind? nothing is better then warm summer rainy days... those days are the most creative for me. 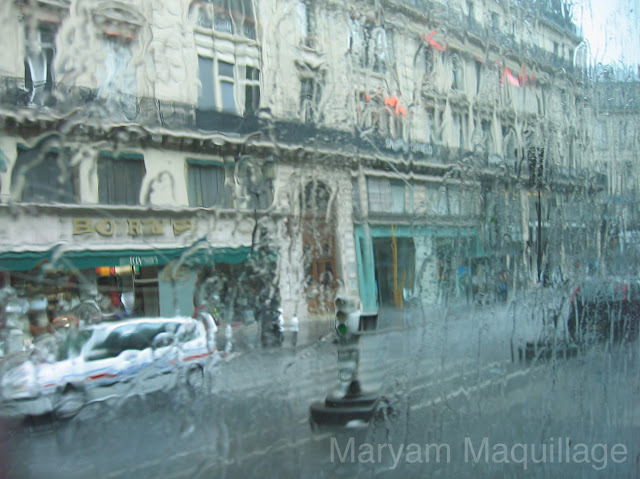 lovely picture of rainy Paris and all above..
Wow I wish to visit Paris someday. I took French in high school, but I hardly remember anything, lol. In college, I decided to study Japanese instead. I love this combo!! Rain makes me really melancholic, I just want to snuggle up inside, under a blanket. I have also left a piece of my heart in Montmartre.. I too love rainy days! So soothing and I love how the earth smells, all wet. thanks ladies!!! Paris rain is indeed the best, it's so darn romantic haha :)) and yes, I definitely got lots of bday cake!!! The rain gods are pleased by your offering! Beautiful smokey eye, reminds me of the sky during an evening thunderstorm. And now you've gone and made me miss jolie Paris. I really need to go back. Alors, I do not have l'argent. very simple and pretty, and that picture should be a postcard! was just wondering if you liked my blog as much i liked yours would you want to follow each other? PS: you just have STUNNING features!!! I love this look - it's so striking yet understated at the same time. I lovee summer rain or just rain in general esp. when you're about to sleep! It makes everything so cozy (: Your eyemakeup look is so pretty! I would love to go to Paris one day! Very pretty as always:) I love that picture, i'm a fan of the rain! super cool makeup! im going to try it out this weekend! That's a really pretty look Maryam and I love the rain picture too. I love the Paris pic! I agree, a grey smokey eye is a makeup essential, it's classy and it always looks beautiful! I love your take on it!